Queen Victoria and Prince Albert immediately found a common interest in music, Albert already being an accomplished composer and keyboard player when they met and Victoria a pianist and singer. ‘Queen Victoria’s Consort’ play on instruments that were invented, developed and championed throughout the Victorian period and would have been common in all walks of life seen by everyone from street bands to royal occasions. Queen Victoria’s Consort play on an unrivaled collection of Victorian brass instruments; it was this era of history that saw the invention of the valved brass instrument and the development of the keyed brass instrument and it is a combination of beautifully restored examples of these that the ensemble is dedicated to brining back to audible life within our concerts. The Distin family first caught the attention of ‘The Illustrated London News” during the week of 7th December 1844 and continued to perform the same concert over the course of that week at ‘M. Jullien’s Concerts’. By 14th December 1844 they had a full review within the Journal. (Original page in the collection of A. Kershaw). This review is very keen to point out their use of the ‘Distin improved Saxhorn’ (one of many instruments the family patented and sold under their name) and Jugs depicting the family were sold as marketing aids and souvenirs after each concert. (Original Distin jug in the collection of A. Kershaw). 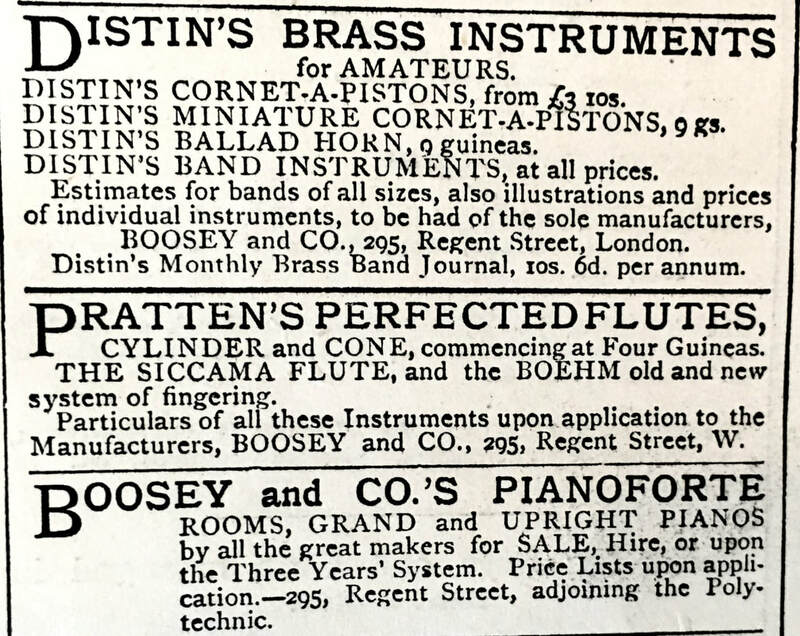 Shortly after this date instruments were advertised to the public as ‘Distin’s Brass Instruments for Amateurs’; an advert in ‘The Graphic’ on 21st November 1874 (original page in the collection of A. Kershaw) states Boosey and Co. as the sole agents. One particular instrument listed is a ‘Ballad horn 9 Guineas’ which was intended as a parlor instrument to perform popular ballads and arias of the time (instrument in the collection of A. Kershaw), however this instrument didn’t develop any further, unlike the growing popularity of the standard brass band instruments, and fell out of use. With the combination of a unique playing skill and the idea of marketing their concerts, instruments, journals and souvenirs, the Distin family could be regarded as one of the first ‘Pop Bands’ of any kind, perhaps the Victorian era’s version of ‘The Beatles’?